late night dinner last night, a photo by telfandrea on Flickr. 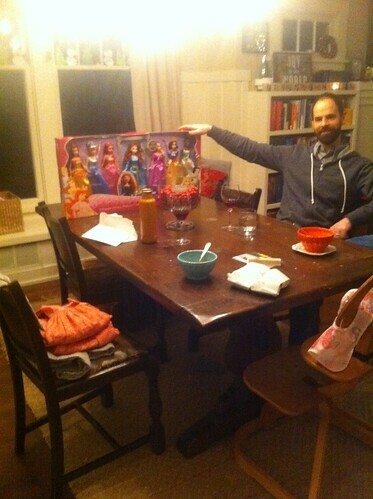 The princesses were the backdrop to a very late night dinner Telfer and I ate on Thursday night. Can you believe I bought these? I can’t either. My girls have been down the toy aisle at Target exactly one time: to buy Gresham a birthday gift. We were at Target earlier this week so we could get the girls some snow gear and we were walking down the kitchen aisle when Cate spotted this box behind a bunch of crockpots. I couldn’t even see what she was talking about but her princess radar was definitely working. Her eyes lit up. She could not believe the glory of the princesses. And so I went back on Thursday afternoon and bought them. And ever since then, all I can imagine is eight naked princesses and their discarded crowns and dresses strewn all over my house. But she will love them.